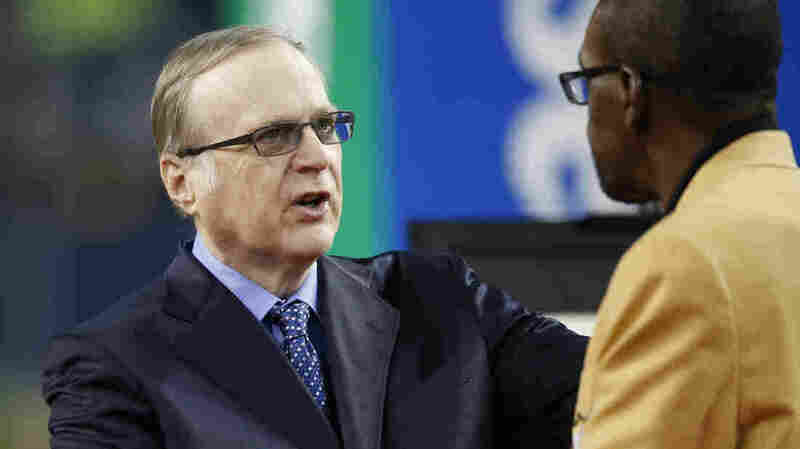 Microsoft Co-Founder Paul Allen Dies At 65 Allen died from complications of non-Hodgkin's lymphoma in Seattle on Monday, according to his company, Vulcan Inc.
Paul Allen greets NFL Hall of Famer and former Seahawk Kenny Easley as his number is retired at CenturyLink Field last year. Paul Allen, who co-founded tech giant Microsoft with Bill Gates, died from complications of non-Hodgkin's lymphoma in Seattle on Monday. He was 65 years old. Allen's death was announced in a statement released by his investment firm, Vulcan. The statement says information on a funeral or memorial service will be released "as it becomes available." Earlier this month, Allen announced in a tweet that the non-Hodgkin's lymphoma which he had "battled" in 2009 had returned and he looked forward to fighting it. Allen and Gates were private school friends and young tech geeks from Seattle who, in the mid-1970's, created a computer language for then-primitive personal computers known mainly to scientists and hobbyists. Allen was 22 years old then, Gates only 19. Both dropped out of college — Allen from Washington State University, Gates from Harvard — to create what was then called Micro-Soft and pursue their ambition of popularizing the personal computer. By the early 1990's, Microsoft's Windows operating system and Microsoft Word were used by more than 90 percent of the world's personal computers. Their efforts made them both billionaires and their names synonymous with the high tech revolution which transformed the global economy. "Paul Allen's contributions to our community, our industry and to our community are indispensable," Microsoft CEO Satya Nadella tweeted. "As co-founder of Microsoft, in his own quiet and persistent way, he created magical products, experiences and institutions, and in so doing, he changed the world." Gates said in a statement that he is heartbroken over the death of "one of my oldest and dearest friends, Paul Allen." "Personal computing would not have existed without him," Gates said, adding, "He channeled his intellect and compassion into a second act focused on improving people's lives and strengthening communities in Seattle and around the world." Gates remained to run Microsoft until January 2000. Allen departed in 1983 amid tensions with Gates and after being diagnosed with cancer. That was before Microsoft went public. Allen, who held on to his shares of the company upon leaving, would eventually enjoy a fortune of more than $20 billion, according to Forbes magazine. That fortune allowed Allen to become the owner of major league sports franchises the Portland Trailblazers of the NBA in 1988 and the Seattle Seahawks of the NFL in 1996. He also was a part owner of a major league soccer team, the Seattle Sounders FC. In recent years, Allen was best known as an investor and philanthropist. He gave more than $2 billion to various endeavors in science, the arts, education and the environment. Along the way he donated more than $500 million to the Allen Institute for Brain Science. In 2010, Allen signed The Giving Pledge, joining other wealthy people in promising to give a majority of their wealth to philanthropic causes. Allen also founded Seattle's Museum of Pop Culture housed in a building designed by architect Frank Gehry and the Flying Heritage & Combat Armor Museum to acquire and preserve vintage aircraft, especially from World War II.